Erin Hart's Haunted Ground offers all three. When a bog body is found in the Drumcleggan Bog, Irish archaeologist Cormac Maguire and American pathologist Nora Gavin team up to investigate not only the red-haired girl's identity, but when she lived and how she died. But that's not the only mystery troubling the small town of Dunbeg. Two years ago, Mina Osborne and her small son went missing. The police suspect her husband, Hugh, but no one knows what really happened. Maybe Cormanc and Nora can help Detective Devaney find evidence to solve that mystery, too. I really enjoyed the archaeological aspects of this novel--how things can be preserved in the peat for hundreds of years, and how, once found, they offer a doorway into the past. I also loved getting to know Ireland a little better--glimpsing part of its history and culture, even its music. But it's the mystery surrounding Mina's disappearance that drives this novel. 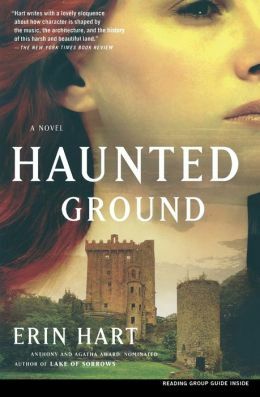 Haunted Ground is well-plotted and well-written, with likeable characters. (Especially 39-year-old flute-playing Cormac with his dark brown hair, intense dark eyes, and lean rower's build, and his love of the past.) There were a few coincidences at the very end surrounding the red-haired girl from the bog that felt just a little too neat and convenient, but that didn't stop me from enjoying this book. It's an interesting mystery; plus, it's set in Ireland...what more could you possibly want? Sounds perfect for an autumn read...I will have to add this one to my list! It's a fun mystery and you can't beat the setting! Sounds interesting and I haven't come across it before. I'll have to check it out. Peaches, apples, and pears....oh, my! Are you a bibliophile, too?